The Buddha, the Awakened One, is certainly one of the most inspirational figures to have ever walked this planet–perhaps the most. His teaching is the foundation of the world’s fourth largest religion (in terms of numbers of adherents)–a religion that has transformed cultures from Afghanistan to Japan, and continues to transform lives around the world. 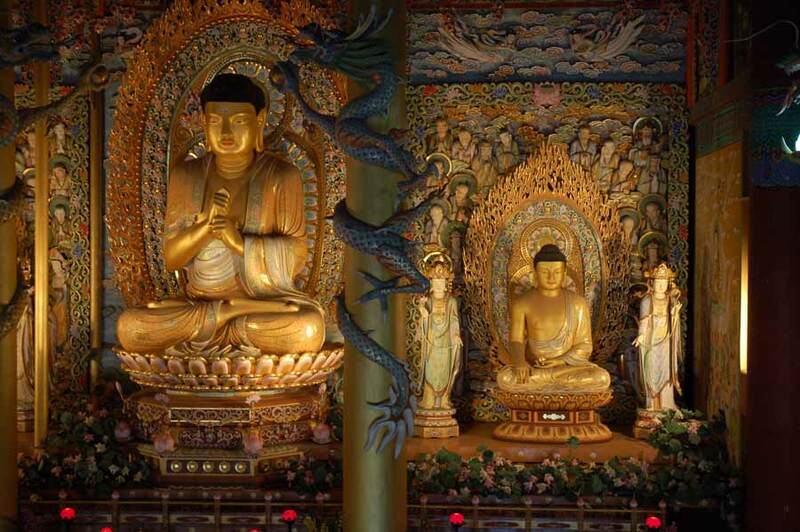 In addition to establishing Buddhism, the Buddha exerted a profound influence on Hindu thought and practice as well. Yet considerable mystery still surrounds this great being. When, exactly, did he live? Of the many stories about his life that exist, which have a literal, historical foundation, and which were created primarily to teach spiritual lessons? If elements of both history and higher teaching are blended within these stories, which elements are which? Other mysteries pertain to the self-understanding of contemporary adherents of ancient spiritual paths–Hindu and Jain paths in particular–in relation to this central figure. How do the Buddha’s teachings relate to those of other wisdom traditions with which he came into contact? Was he an entirely original thinker–a pure innovator–or was he a reformer of existing traditions? We know that Buddhism influenced later Hindu thought because Hindus and Buddhists engaged in extensive debates with one another over the course of many centuries and incorporated elements of one another’s ideas into their own through time. The Advaita Vedānta of Śaṅkarācārya certainly bears a strong imprint of Buddhist thought, even as the great Śaṅkara sought to defeat the Buddhists of his time in a struggle for the heart and soul of India. 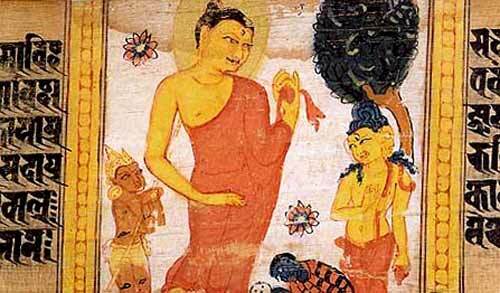 Do the earliest traces of Vedānta in the Upaniṣads owe their existence to the Buddha? Or was the Buddha, as some claim, basically a Vedāntic thinker, influenced by the thought of the Upaniṣads, whose followers turned his teaching into a rival tradition? The Buddha and the Upaniṣads: which is the chicken and which is the egg? Or is the relationship even more complex than this? To some extent, these mysteries–the very fact that they are mysteries, that they exercise our imaginations at all–are an effect of a western preoccupation with literal, factual truth, and also with the politics of rival religious traditions. Who is older? Who influenced whom? Certainly the Buddha, based on all we can glean about him, would not want us to become fixated on such issues: on what literally happened in his life, and who influenced whom, and who came first. The aim of his teaching is to help all beings attain freedom from suffering, not to puzzle over historical issues. Yet, we are curious beings, and the Buddha was himself possessed of a keen, analytical mind. 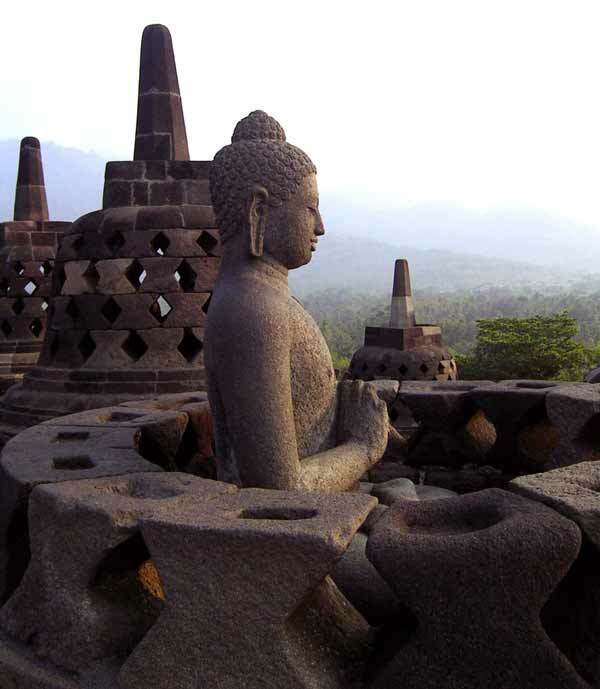 In the hope that an exploration of these questions might lead us to a deepened appreciation for all of the strands of tradition that weave their way through these issues–Buddhism, Vedānta, and the much-neglected Jain tradition–let us explore the relationship between the Buddha and the other traditions of his time and place. Painting of Gautama Buddha having descended from Triyatrimsa Heaven, attended by devas. written in the Ranjana script. Nalanda, Bihar, India. Circa 700-1100 CE. One of the first questions such an exploration raises is when, precisely, the time of the Buddha occurred. Traditional Theravāda Buddhist sources in Sri Lanka and Southeast Asia date the life of the Buddha from roughly 624-544 BCE. More recently discovered Indian sources, however, place his life much later, from 448-368 BCE. All sources agree on certain basic facts: that he lived to be eighty years old, that he set out on his journey to awakening around the age of thirty or thirty-one, that he achieved his awakening after six years of intensive searching, that he spent his early life in the city of Kāpilavastu, in what is now Nepal, where he was born to a life of privilege as the son of royalty, and that his awakening occurred in Bodh Gaya, in what is now the Indian state of Bihar. Though there is still disagreement among many learned scholars, a consensus has begun to emerge that would place the life of the Buddha from roughly 490-410 BCE. A number of persons and events mentioned in accounts of the Buddha’s life and other chronological sources about this period have been verified and can be located firmly in time (such as the years in which a particular king reigned, and so on), giving us a clearer picture of the time when the Buddha is likely to have lived. An exciting archaeological find at Lumbini, in Nepal, traditionally believed to be the site of the Buddha’s birth, was recently announced with some fanfare on the internet as likely to push back the scholarly consensus about the dates of the Buddha by several centuries. ( http://press.nationalgeographic.com/2013/11/25/birth_of_buddha/) Specifically, at the Māyā Devī Temple, previously believed to have been built during the time of Aśoka, the famed Buddhist emperor of the Maurya Dynasty, in the third century BCE, it was found that an older structure existed, dating back to the sixth century BCE. If this structure is in fact a commemorative monument to the birth of the Buddha, this would be consistent with the older, Theravāda dating of the life of the Buddha to the late seventh and early sixth centuries. But what, then, of the other evidence placing the life of the Buddha in the fifth century? This is where some caution must be exercised in reaching conclusions about what certain discoveries actually reveal. According to the traditional accounts of the Buddha’s life, he was born under a tree in a grove in Lumbini. His mother, Māyā Devī, was traveling to a site away from the hustle and bustle of the city and the palace that was her home in order to give birth to her baby, whose birth had been preceded by a series of visions in which the unborn child had communicated to his mother that he was to be the next Buddha, and was coming into the world for the enlightenment of all beings. On the way, as her royal procession was passing the Lumbini grove, the queen felt the pangs of labor and had her entourage stop. She got out of her carriage, grabbed hold of the limb of a tree (a tree that, by some accounts, actually bent down its limb to assist her), and gave birth to her baby in an unusual standing position. The baby is then said to have taken eight steps, and lotus blossoms are said to have sprung up in his footprints. He then announced his mission to the world. A few months after the birth of this miraculous child, it is said that his mother passed away. He was subsequently raised by his maternal aunt, Mahāprajāpatī, who also later became the first Buddhist nun. Even the most mildly skeptical reader, even one open to the idea that an historical basis must underlie the life story of the Buddha, will likely doubt the literal truth of a story of a baby who immediately takes eight steps (in which lotus blossoms spring up) and speaks. Taken literally, the story is not even consistent with the rest of the account of his life, in which he displays no special knowledge of his destiny, and in which his father is actually able to conceal from him, for a period of time, the basic natural facts of sickness, old age, and death. While it is not unknown for women to be named Māyā in South Asia, and while it is not impossible that the Buddha had a mother named Māyā who passed away shortly after his death, after which he was raised by his maternal aunt, when one finds miraculous, highly unlikely stories in a spiritual text, this does not mean that one should simply dismiss such an account. It is, rather, an invitation to dig more deeply into the meaning that the story is intended to convey. Māyā , often mistranslated as illusion, is a term of great importance to both Buddhist and Hindu systems of thought. Better translated as appearance, māyā is the way in which our consciousness presents reality to us. As such, māyā is a double-edged sword; for it can both conceal and reveal the true nature of reality. Tapping into earlier Vaiṣṇava thought, Sri Ramakrishna spoke of vidyāmāyā and avidyāmāyā: the māyā of wisdom and the māyā of ignorance. Māyā itself is one; but whether we utilize the reality presented to our mind in order to discern more deeply, to penetrate to the true nature of reality, or whether we become caught up in surface-level appearances, depends upon us, and our spiritual level of maturity. To say that Māyā gives birth to the Buddha, on a philosophical level, is to say that appearance gives birth to awakening. The world of appearance is the womb of our enlightenment. Through our experiences in this life, if we learn our life lessons and cultivate insight from our experience, we, too, can become awakened. The embryonic potential for Buddhahood–called the tathāgatagarbha in later Indian Buddhist traditions, and Buddha Nature in Mahāyāna Buddhism in East Asia–emerges from, and indeed is the child of, Māyā. And it is interesting that the Buddha’s mother passes away shortly after his birth. With the rise of awakening, appearance–māyā–passes away, replaced by the true, unimpeded vision of reality. This spiritual meaning of the story of the Buddha’s birth gives us pause when thinking of which parts of the story to take literally and which to see as pointing to a deeper level of insight. And of course the two are not mutually exclusive: literal and symbolic truth. Maybe his mother really was named Māyā, and maybe she really did pass away shortly after his birth. But that walking, talking baby suggests that something else is also going on. As early as the Indus Valley Civilization, people in India have regarded trees as sacred, and have worshiped the living spirit of a tree in the form of a Goddess, sometimes known as a yakṣī. Yakṣīs are typically associated with fertility–with growth and living things–and are especially honored in the early Buddhist and Jain traditions. It cannot be a coincidence that two key events in the life of the Buddha, events associated with birth, growth, and transformation, occur beneath a tree: his physical birth in Lumbini as the baby Siddhārtha, child of Māyā, and his “birth” as the Buddha, the awakened one, under the Bodhi Tree at Bodh Gaya. It seems highly likely that the ancient Māyā Devī Temple, built around a sacred tree in the sixth century BCE, is a temple to a Māyā Devī who was a long-honored Yakṣī, or tree Goddess, whose cult may date back considerably earlier even than the sixth century BCE, and to whom the Buddha, hailing from the same region centuries later, was assimilated. The story of his birth to a queen Māyā on that particular spot may be a symbolic way of affirming the status of this great awakened being as child of the soil, a son of Māyā Devī, who went on to enlighten the world. Popular accounts of the life of the Buddha which have shaped the world’s perceptions of this important figure, such as those found in high school textbooks, often depict him as a kind of “Protestant reformer” of a Hindu tradition steeped in irrational ritualism and the dominance of a priestly caste–the dreaded Brahmins–bent on forcing Indian society into a rigid caste hierarchy. This depiction, which we might call the myth of the Buddha as a social revolutionary, has its roots not so much in actual Indian history as in the history of the west: specifically, the legacy of anti-Catholicism (and behind that, of anti-Semitism) that projected onto India a universalized notion of western progress from an era of ritualistic, magical thinking to an era of scientific rationality. Such a notion is not only inadequate to the complexities of ancient Indian intellectual history; it is not even an accurate view of Western history. But that is a story for another day. The myth of the Buddha as a social revolutionary fits well with a Hinduphobic narrative, in which Hinduism is identified exclusively with a repressive social order dominated by a priestly community that uses the superstitions of the masses in order to maintain its grip on power. The Buddha, one of the wisest and most admired persons in all human history, is certainly an effective figure to have on one’s side if one wants to criticize Hinduism. 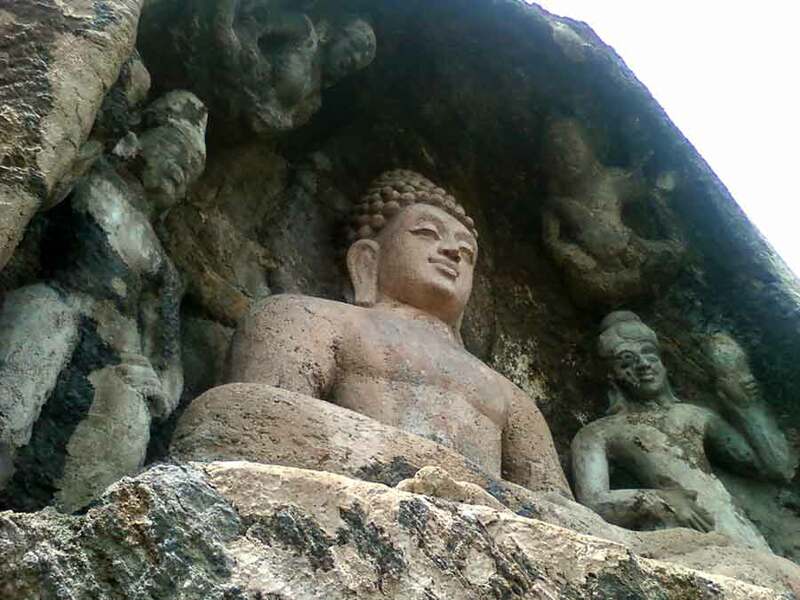 Progressive Hindus, however, have also embraced this image, arguing that the Buddha was not an external critic or a rejecter of Hinduism, but rather a friendly internal critic, a reformer, recovering and advancing the true spirit of the tradition against the unfortunate tendency toward conservatism and ossification to which all traditions are subject. The Buddha is, on this account, more authentically Hindu than the Brahmins he criticized. Even a casual examination of the earliest Buddhist scriptures, however, reveals that the relationship between the Buddha and the Vedic traditions now collectively called by the name Hinduism is not so simple as either of these interpretations presupposes. First, the Vedic traditions are not monolithic, even as depicted in Buddhist texts. And the Buddha is much less interested in social reform or revolution than in personal transformation. In regard to the myth of the Buddha as a social revolutionary, one does not find him, in the Buddhist scriptures, advocating for an overturning of the social system. He does not say, for example, that there should be no Brahmins, nor does he castigate the Brahmins as a wicked or unjust group of people. Indeed, quite surprisingly to one who has become accustomed to seeing the Buddha through the lens of this popular myth, he uses the word Brahmin to refer to a person with good and noble qualities. What he does do, though, is differentiate a true Brahmin, a good and pure person, from a mere Brahmin by birth. “It is by one’s deeds, not by one’s birth, that one becomes a Brahmin.” The entirety of the twenty-sixth chapter of the Dhammapāda is in fact dedicated to describing and praising the qualities of the true Brahmin. So the Buddha operates within a Vedic thought-world, broadly construed. However, while one does not find the Buddha rejecting Vedic culture in its totality, one does find the Buddha questioning, in a frank and straightforward fashion, the unverified claims made by certain Brahmins whom he encounters. These Brahmins are themselves a diverse group. Some are clearly ritualists, perhaps predecessors or early adherents of the Mīmāṃsā school of thought, who affirm the efficacy of Vedic ritual. Others, though, are of a more theistic orientation, and seem to prefigure the later Hindu bhakti traditions, with the idea of devotion to a personal Supreme Being. Some Brahmins in fact join the Buddha’s movement and become his disciples, a trend that would persist throughout the history of Buddhism in India. The Buddha is skeptical about Vedic ritual, and rejects it to the extent that it involves cruelty to living beings, in the form of animal sacrifice. He also questions the necessity of the existence of a creator God. And as we have already seen, he does not so much reject the social order as redefine it. Birth caste has no relevance to one’s capacity for spiritual attainment, and it is one’s capacity for spiritual attainment that interests the Buddha. He gently ridicules the pretentions of the Brahmins he encounters that take special pride in their birth-caste. Now, one who wishes to defend the myth of the Buddha as a social revolutionary could say that these are, indeed, revolutionary ideas and pronouncements that strike at the very foundations of Brahminical authority: questioning and even rejecting dimensions of Vedic ritualism, questioning the existence of Brahmā, the creator, and redefining what it means to be a Brahmin in such a way as to undermine the very notion of birth caste. This is all certainly true. However, an attempt to depict the Buddha as an arch-opponent of early Hinduism is undermined by the fact that all of these questions and criticisms also occur within the Vedic texts themselves: specifically, in the contemplative esoteric texts known as the Upaniṣads. Regarding birth as a Brahmin, the Bṛhadāraṇyaka Upaniṣad contains the famous story of Satyakāma, the illegitimate son of a servant woman. Wanting to become a Vedic teacher, Satyakāma must recite his lineage to the Brahmin he approaches to be his guru. When he is honest about his background, he is accepted as a student–a true Brahmin–and given initiation. This, of course, lends credence to the second interpretation: the Buddha as a reformer of Hinduism (or of the tradition that would later be known as Hinduism), a follower of the true Vedānta of the Upaniṣads, whose views are very much in keeping with the ideas in these ancient Vedic texts. It is at this point, however, that the “chicken or the egg” question arises. Does the fact that ideas can be found in the Upaniṣads similar to those expressed by the Buddha mean that the Buddha can be categorized as an Upaniṣadic thinker, or does it mean that those who authored the Upaniṣads were influenced by Buddhism? Or does it perhaps mean something else entirely? Was the Buddha a Vedic reformer, or an external critic whose ideas were so compelling that they were eventually accepted into the Vedic canon? Here, we enter a realm of scholarly guesswork. The Upaniṣads are of course a collection of many texts, written at widely differing periods, including some written within the last five hundred years. When scholars refer to the Upaniṣads, they are usually referring to the principal Upaniṣads–roughly a dozen truly ancient late Vedic texts generally held to date from the first millennium BCE. The Buddha of course lived right in the middle of this period, a period marked by incredibly intellectual and spiritual ferment, not only in India, but globally. This is the period of the Axial Age, in which intellectuals from cultural centers as varied as India, China, and ancient Greece began to turn from a spirituality focused upon the maintenance of the cosmic order toward a spirituality of personal transformation with a strong ethical emphasis. Socrates (and pre-Socratic philosophers such as Pythagoras), Plato, Confucius, Lao-tzu, the Buddha, Mahāvīra, and the authors of the Upaniṣads are all exemplars of this massive shift in human consciousness. Do any of the Upaniṣads, particularly those with passages that resonate with Buddhist thought, predate the Buddha? The best candidates here are the Bṛhadāraṇyaka and the Chāndogya Upaniṣads, both of which are widely held by scholars to date from roughly the seventh or sixth centuries BCE. Both of these texts also contain almost identical parts that articulate an understanding of the process of karma and rebirth that is very close to a Buddhist understanding. The Bṛhadāraṇyaka Upaniṣad is, in fact, probably the oldest Upaniṣad of all. It contains the greatest amount of ritual imagery from the earlier Vedic literature, indicating that it is a transitional text, from an earlier period when the main focus in Vedic thought was upon the ritual and its meaning, to a later period, in which Vedānta philosophy develops, that is more focused upon a personal realization of truth and freedom from the cycle of rebirth. The earliest Vedic literature to be composed, the Saṃhitās, consist of hymns to deities, or devas (literally “shining ones”), and ritual instructions. These texts are supplemented by the later Brāhmaṇas, or “priestly texts,” which explain the rationale behind many of the rituals, often in terms of stories or riddles that are difficult to comprehend for one not already steeped in Vedic ritual culture. The Brāhmaṇas, in turn, are supplemented by the Āraṇyakas, or “forest texts.” The Āraṇyakas–composed, as their name suggests, in forest retreats, or āśramas (ashrams)–delve more deeply into the metaphysical meaning behind the Vedic ritual, and for which the Vedic ritual is increasingly seen as symbolic. Finally, the Āraṇyakas are supplemented by the Upaniṣads. The very title of the Bṛhadāraṇyaka suggests that this text was compiled before the genre of Upaniṣad had been established, and that it was seen by its original authors as an Āraṇyaka. This of course suggests that this text could well be the most ancient of the Upaniṣads. If the scholarly consensus as to its age is correct, then this text would predate the Buddha by some two centuries. The possibility is thus opened up that the ideas in the text, and possibly the text itself, formed an important influence on the Buddha’s thought. 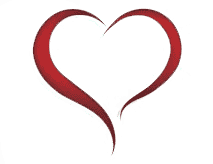 Of particular importance, it is in this text that the role of desire in the process of rebirth and the attainment of liberation from rebirth is first expressed: “Being attached, he [a person who dies], together with his work [karma], attains that result to which his subtle body or mind is attached. Exhausting the results of whatever work he did in this life, he returns from that world [the heavenly or ethereal realm that beings inhabit “between” lifetimes] to this world for fresh work. Thus does the one who desires take rebirth. But the one who does not desire is not reborn. For one who is without desire, who is free from desire, the objects of whose desire have been attained, and to whom all objects of desire are but the Self, there is no rebirth. Being but Brahman, such a one is merged in Brahman.” (Bṛhadāraṇyaka Upaniṣad 4.4:6) Except for the language of “Self” and “Brahman,” this teaching could well have been uttered by the Buddha, and may well have shaped his thinking. Johannes Bronkhorst, however, has raised the possibility that the consensus of scholars regarding the age of the Bṛhadāraṇyaka Upaniṣad is incorrect. In his controversial and groundbreaking work, Greater Magadha, Bronkhorst argues that the Bṛhadāraṇyaka is, in fact, post-Buddhist, and is indeed a considerably later text than most scholars care to admit. Bronkhorst’s argument hinges upon the fact that important Vedic thinkers such as the famed Sanskrit grammarian, Pāṇini, who lived around the same time as the Buddha, do not seem to be aware of this text, not mentioning it in their own works. While Bronkhorst’s method is sound–using references to texts in other texts to establish at least a relative chronology–it may not be foolproof. Vedic texts were typically passed on orally, sometimes for many generations, before taking on the final, written form that they have today. The ideas in the Bṛhadāraṇyaka may well have been in circulation long before Pāṇini (and the Buddha), even if the final version of the text was not yet fixed. The verdict on Bronkhorst’s argument remains mixed, and it is likely the implications of his work will take time to be fully felt in the scholarly community. Richard Gombrich, as established a scholarly authority as it is possible to be in the study of early Buddhism, is of the view that the Bṛhadāraṇyaka does, indeed, predate the Buddha, and argues that the Buddha engages with it explicitly in the early Buddhist scriptures. The factor in Vedic thought which Gombrich attributes to the Buddha is not the fact of karma and rebirth, nor the role of desire in the processes of both rebirth and liberation, both of which are found, as we have just seen, in the Bṛhadāraṇyaka. Gombrich attributes the Buddha, though, with what he calls the “ethicization and universalization” of karma. Earlier articulations of karma in Vedic texts treat it exclusively in a ritual context, where a karma is an action that one performs in a Vedic ritual in order to achieve a particular result. The Buddha, however, teaches that all actions are karmas, and that the results they produce depend on the intention with which they are performed, with good actions producing a good (albeit temporary) result and evil actions producing suffering. Gombrich, however, does not take the view that this ethicization of karma was original with the Buddha; for he is well aware that a tradition of viewing karma in terms of ethical action was already very much present in the Buddha’s cultural milieu–the Jain tradition. The Jain tradition has a claim to antiquity that rivals that of the Vedic traditions. Though the contemporary Jain community is traced to the figure of Mahāvīra, a contemporary of the Buddha (who most probably lived from 499 to 427 BCE), according to Jain tradition, Mahāvīra is the twenty-fourth in a series of enlightened beings called Tīrthaṅkaras who periodically appear on earth to teach the path of liberation. Jainism is best known for its very strong emphasis on ahiṃsā, or nonviolence, enjoining strict vegetarianism for all its adherents, and a path for its ascetic community that includes avoiding harm even to tiny, microscopic organisms. The twenty-three Tīrthaṅkaras prior to Mahāvīra are difficult to locate in terms of historic time, as accepted by mainstream scholars. Pārśvanātha, though, Mahāvīra’s immediate predecessor, the twenty-third Tīrthaṅkara, is widely accepted to have existed, and to have lived in either the eighth or the seventh century BCE. Pārśvanātha is often depicted in a meditation posture and protected by a seven-headed cobra rearing up behind him, just as the Buddha and Lord Viṣṇu are also depicted in later Buddhist and Hindu art as protected by a serpent companion. If one combines both Gombrich’s and Bronkhorst’s insights, an intriguing picture of the Buddha emerges as a figure standing at the confluence of two streams of ancient Indian thought, bringing them together into a powerful synthesis, the influence of which would reverberate throughout the history of both India and the world. The Buddha may well be seen as a reformer within the stream of early Vedānta, as found in the Upaniṣads, but it is just as accurate to call him a Jain reformer. 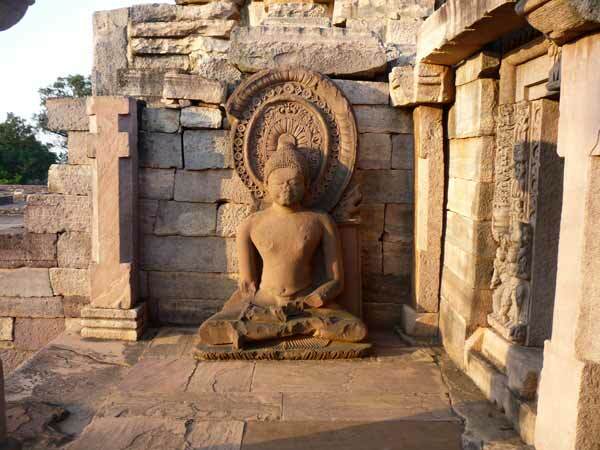 As Gombrich shows, early Buddhism is just as replete with Jain terminology and assumptions as it is with terms and assumptions of the Vedic traditions. The best assessment of the relationship of the Buddha to the other systems of his time is that he was combining them. The “middle path” is a middle path, we could say (somewhat anachronistically) between Hinduism and Jainism. Setting aside his argument for a late date for the Bṛhadāraṇyaka, Bronkhorst advances a fascinating hypothesis that two distinct branches of Indian culture co-existed in the first millennium BCE, and that these two cultural streams gradually intermixed and merged to form classical Indian culture (and what we now know as Hinduism). He locates one of these streams, the Vedic, in the northwest of the subcontinent. It is the stream associated with Vedic ritualism and a central role for the Brahmins in society. The other stream, which he calls “Greater Magadha,” is rooted in the eastern half of the Ganges Valley, the homeland of the śramaṇa or “striving” traditions of ascetic renunciation aimed primarily at liberation from the cycle of karma and rebirth (including Jainism and Buddhism). In many ways a very modern figure, to whom contemporary seekers can certainly relate, this Buddha exists, as we do, in a pluralistic world, and looks for insight wherever he can find it. Part two of this series will continue with reflections on No Self, Emptiness, and the Path of the Bodhisattva.